– Mia Olsen left the band to start a new one, because she thought there was too many skulls and too little flowers involved, and she was right to do so, because that will most likely not change. MMP – Could you describe yourselves in a few words? All three members of the current lineup, has been friends and family for most of our lifes. WE have known Jeppe since 1984. So when touring we usually get well on our way without too much trouble, and we know each other well enough to leave each other alone when needed. We have been playing together since the 80’ies where we started out in a new wave band, and later on we played in a post rock band releasing 3 albums. Kristian and Peter has been playing with Nekromantix as well, so weve been active together for quite a while. This also means that we know each other very well on stage, in the studio, in the rehearsalroom, etc. and that’s also a big advantage. Off course we are also great fans of Ennio Moricone, Dark Disco, Psychobilly, and a lot of other great bands out there worth listening to. HG – Jeppe and Peter started out in the summer 2005, working on a soundtrack for a comic book by our LA friends and graphic artist Gris Grimly, called Cannibal Corpse Riot. The title was later changed to Cannibal Flesh Riot, and ended up being a movie, that we did the score for, and released as our first album. The score won two awards in 2007 for Best horror movie soundtrack of the year. While working on material, we needed a drummer, and I had long had the urge to work with a drum machine, so we got hold of an old Roland 707 from a pawn shop. The owner said he had won it in a tequila soaked poker game in Tijuana. He claimed it was haunted, and we got it for cheap. It turned out that drum machine had a very Mexican vibe, and soon the music turned from a more horror punk and psychobilly style towards latin and mariachi inspired kind of rock’n roll – That’s when we game the machine the name “Ghost 707” and a drum solo in the set, that was also released on the second album. HG – Yes – Kristian and Peter both play in different bands on the Copenhagen rockabilly / Rockn Roll scene, and all three members has worked together as backing band for a singer named Linda on her Killer Hippie – project, and for Danish punk legend Knud Odde in a neo goth project called Mothlight and Danny and the Doomsters. At the same time the old post rock band Schwarzwald Library was never officially split up, and there might be vinyl release ahead and maybe even live appearance again. MMP – What are your occupations outside the Hola Ghost? HG – Peter works as an architect as a head of projects, Jeppe is working in a national cultural institution as a leader and Kristian is working for Disney Denmark as a project manager, managing the voice over for movies and cartoons. MMP – Let’s talk about the Denmark Psychobilly scene. What are the current bands you like? HG –Good music of all kinds. We grew up in the 80’ies, and the whole dark wave/new wave and punk scene was a great mind opener back then. But we came from Beatles, Elvis, Carl Perkins and we also liked pop music and the old school metal bands all along, and some black metal as well for the great melancholic and romantic Scandinavian sounding guitar themes that often contrasts the grim voice of the singers in black metal bands. HG – Psychobilly is a mix of 50’ies rockabilly and the energy and raw filth of original punk. In the last 10 years or so, two new directions have emerged within the genre, where one tends to mix with metal instead of punk, and one mix with pop. Hola Ghost is not a psychobilly band, as we neither have an upright bass nor sound like a rockabilly inspired band. 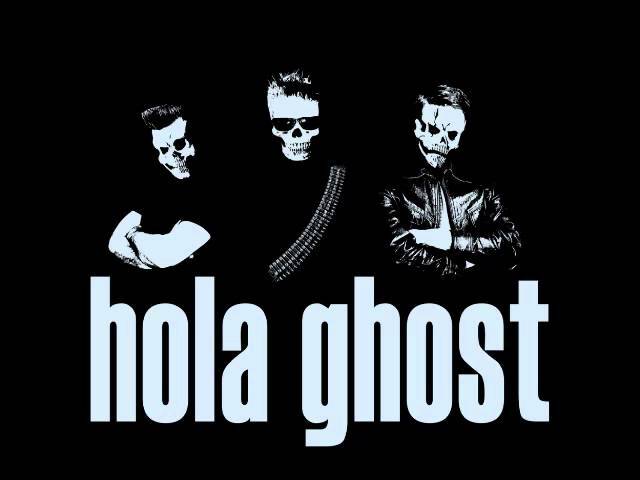 But since two of the members have a past in Nekromantix, Mad Sin and Dead Kings it is clear that there is still a connection between Hola Ghost and psychobilly, that can also be heard within the music and the horror related song themes and lyrics. HG – Yes – We play one or two concerts a year in Denmark, and the rest of our shows are in other countries. Over the years we have played in: Norway, Sweden, Finland, Russia, Croatia, Holland, Switzerland, Spain, France, England, USA, Mexico and Brasil. HG – Once on a tour in Switzerland once played a show in a smaller town called Rorschach. There was a few rockabillys skinheads and psychobillies who came down with train from small mountain villages. Then there were a goth couple who came from Zürich, some local punks and teens since it was the only thing happening that night. Then there were also a bunch of older tourists, who happened to be out that night, and a talent scout from Sony – Switzerland who were very interested until we answered him honestly when asked about our age. There were also a festival in Brasil, where we played in the afternoon on a stage with some rather young metal/punk bands. All their young friends were there hopping around, while their latino mothers were sending us big brown eyes from the back of the room – These two stories ad up quite well, that there is no typical Hola Ghost fan, and everybody is welcome at our shows . But there is however a main part of our followers who are connected to the psychobilly scene as well, due to the past of Peter and Kristian in Nekromantix and other psychobilly bands. HG – We are working on new material at the moment. We are doing a soundtrack for a comic book (again) and there should be s 7 inch single out this fall some times. MMP – What are the future tour plans for Hola Ghost? HG – We did two videos over the last few years, and that was a lot of fun, and a very interesting process to handle from start to the end all by ourselves. So it could be a movie starring ourselves as theme as well as soundtrack composers. We are into graphics, paintings poetry and theatre as well, so some kind of weird cross over project could be fun too. HG – NO! – we are not dead, we are ghosts!